Take I-70 east to West Glenwood Springs exit (#114). Make 2nd right off of round-about onto Midland Ave. Continue over the river and under the train trellis. The Glenwood Springs Community Center is approximately 1.5 miles on your right AFTER the Glenwood Meadows shopping center. 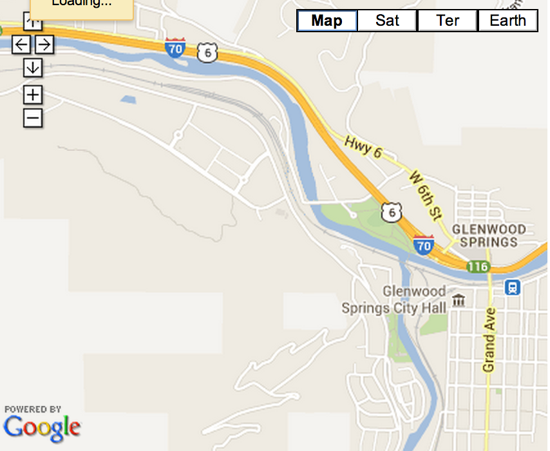 Take I-70 west to the West Glenwood Springs exit (#114). Go Â¾ of the way around the 1st round-about & turn to go under the I-70 bridge. On the 2nd round-about, make 2nd right off of it onto Midland Ave. Continue over the river and under the train trellis. The Glenwood Springs Community Center is approximately 1.5 miles on your right AFTER the Glenwood Meadows shopping center. Take Glen Ave north (Hwy 82 turns into Glen Ave at McDonalds) to 27th Street, turn left. Travel across Sunlight Bridge and turn right onto Midland Ave (second right after the bridge). After about 1.5 miles there will be a 4-way stop sign, continue straight through this intersection and also straight thru the stop light. The Community Center will be on your left (approximately 1/2 mile from the stoplight). From Grand Ave, turn west on 8th Street. Take the next right onto Colorado Ave, then the next left onto 7th Street. Stay on 7th (7th turns into 8th) till you come to the stop light, which is Midland Ave, turn right. The Community Center is approximately 1/2 mile on your left. Go south across the Colorado River bridge to 8th Street, turn right. Take the next right onto Colorado Ave, then the next left onto 7th Street. Stay on 7th (7th turns into 8th) till you come to the stoplight, which is Midland Ave, turn right. The Community Center is approximately 1/2 mile on your left.